The film tells the story of the epic multi-million-pound robbery initially believed to be undertaken by a gang of super-thieves. The actual perpetrators were a group of tough-guy retired criminals in their late 60s and 70s - with all kinds of physical maladies - who were mostly unoccupied and bored, until they consulted a bunch of how-to books and figured out a way to pull off one last hurrah. Entering the Hatton Garden Safe Deposit Company property via a lift shaft, they drilled through the 50cm thick vault walls with heavy machinery and escaped with a haul estimated to be worth around £200 million. 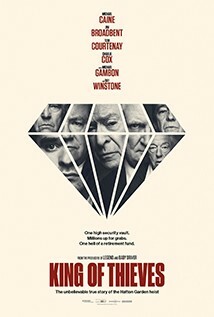 The all-star cast of thieves includes Michael Caine, Jim Broadbent, Ray Winstone and Michael Gambon.